One True Hope's cinematographer, Anneliese, shares her thoughts about making the film in Prague. All the holes in her story are probably due to the Moravian wine. The story for One True Hope came from Anto Howard's The Boulevard, which in turn had been adapted by the author into The Nightwatchmen, a play which I had seen in 1997. When Geoff and I decided to adapt the story for this film, we had to carefully plan around the limitations of the program; we would receive only 18 minutes of raw stock, no sound equipment, and after much pleading we received one light for the interior night scenes of Annette. When we got to Prague, we were introduced to a producer from the film school who had been assigned to our project, and we began searching for actors through the portfolios of a local casting office. The story originally took place in Ireland, and while we wanted to show off the beautiful city, we also wanted to keep an anonymous Western-European feel to the film. This made casting quite a challenge, as almost all of the actors we saw were heavily Slavic in appearance. We also made the unpopular choice of shooting Vision stock (250D) instead of the still-available-in-Eastern-Europe EXR. All I have to say is this: Just because you CAN shoot on EXR does not mean you SHOULD. Kodak introduced Vision for a reason; the colors are great, the grain is fine - two qualities we wanted for our modern-day fairy tale. Also, we shot in the old-fashioned 1:1.33 ratio as this film is nowhere near hip enough to need anything wider. Location scouting was the best part of pre-production; we wanted a knight motif to run throughout the film, and we found a statue of St. George slaying a dragon in the courtyard of Prague Castle; Jana, the producer, turned a little green at that, but she called in a favor so we could get the location for a morning shoot. A friend of Jana's provided the apartment building, but the villa took a little more time to find; after wandering through most of the high-class areas of Prague, we eventually found a suitably rustic house that we later discovered was two doors down from Vaclav Havel's house. Hell, no, we couldn't do that in America! We probably have some kind of policy about keeping film students as far away from the president as possible . . . 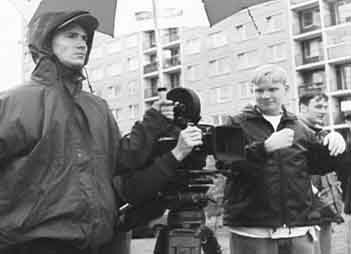 When shooting actually began, the differences been Prague film students and NYU film students became a bit painfully obvious. At NYU, you are trained to get the shot, no matter what, just try not to get arrested. In Prague, producers don't respond well to "we'll just hop on this moving tram and get what we need." But a far more annoying problem was the language barrier - none of our actors spoke any English, and it was a bit frustrating to have Geoff's direction boiled down to a few sulky words from our teenaged interpreter. Especially when the direction is "Now, the cinematographer is going to be precariously perched on a ladder directly above you while you lie on the floor. Look straight at the camera as if it is the face of someone you love." Apparently, this doesn't translate well. As soon as we got the film back, we assembled a rough cut in the AVID machines at FAMU; with no voice-over yet, the film didn't entirely make sense, and the teachers loved to yell "cut!" at every long take that was waiting for sound. When we got back from Europe, we finished our picture lock on Final Cut Pro, then cut up our work print and shot it on DV off a Steenbeck. (Low-tech but cheap) After recording the voice-over, we finished the sound design on Final Cut Pro, and the rest of this story is negative cutting, sound transfers, etc. All the really boring yet heinously expensive stuff. The final prints were handled beautifully by Colorlab; the film has just been transferred to video and is winging it's way to a film festival near you . . .
Back to "One True Hope"